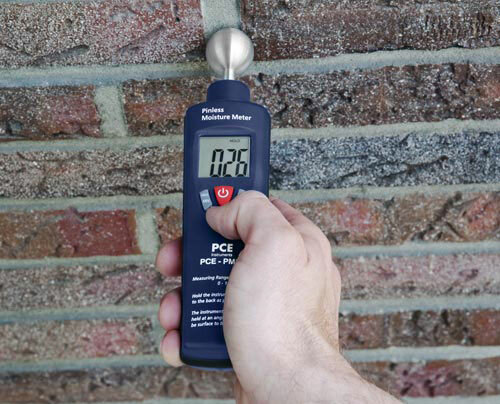 The Material Moisture Tester PCE-PMI 1 is an ideal device for local control at wood yards, building purposes or for use within the house. The material moisture meter enables fast and reliable determination of moisture content in wood and building materials. The battery-powered device doesn't damage the surface of the material while taking measurements of the moisture content. This measurement method also allows repeated measurements at the same place. The PCE-PMI 1 testes is applied in construction, wood, tool trade and sanitary facilities. The material moisture meter has an important role in the non-destructive control of wall drying. In new buildings, the masonry has to dry before plastering. Otherwise the walls cannot release sufficient moisture. 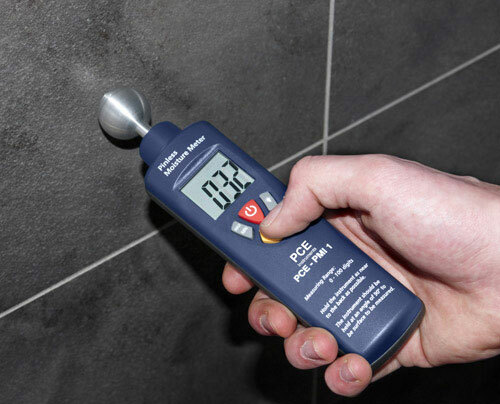 In older buildings with poorly insulated walls, the moisture meter can aid in finding damp places. Here are the most important topics of mould, heating and ventilation. In the wood processing industry and forestry, the Material Moisture Meter PCE- PMI 1 is used to determine the moisture in wood. The drying status is critical to the further use and therefore the value of the wood. The housing of impact-resistant plastic protects the hand-held device when used in harsh environments: building purposes, in wood or in machine shops. The operation of the Material Moisture Meter PCE-PMI 1 is very simple. A light touch of the material with the measuring ball is enough to measure degrees of moisture up to 40 mm deep into the object without damaging it. After pressing the yellow button, the measured values appear on the display in comfortable large numbers. These are, due to the backlighting, even in poor light conditions, easy to read. The min./max. function saves peak values for different measurements. 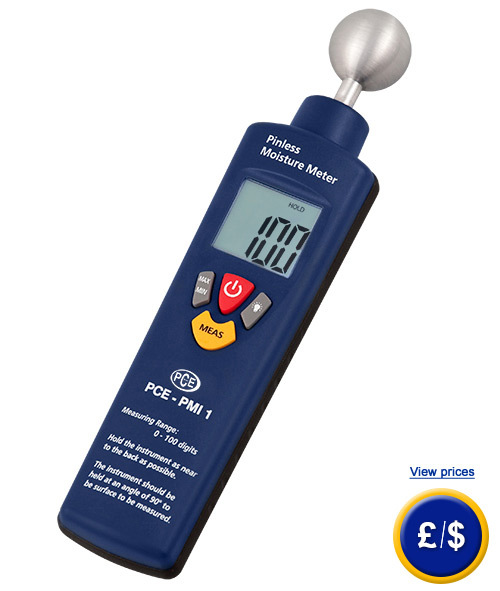 The ergonomically designed Material Moisture Meter PCM-PMI 1 with its four different coloured buttons is user-friendly. The Material Moisture Meter PCE-PMI 1 measures the electrical resistance of the material for determining its moisture content. The measured value is shown in the measuring range from 0 up to 100 digits on the display. If you have any questions about the Material Moisture Meter, please contact us: UK customers +44(0) 23 809 870 30 / US customers +1-410-387-7703. An overview of all Material Moisture Meters can be found here: Material Moisture Meters. Our technicians and engineers will gladly give you advice on this material moisture meter and all other products in the field of measuring instruments, regulation and control and scales. Here you can see further products in the field of "Material moisture meter".